WORLD PREMIERE!!! It is 1940 in Windsor Ontario Canada. A shot is fired. And so begins the mystery of Hedda Noir! 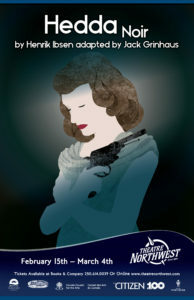 One of theatre history’s greatest plays, Hedda noir tells the story of a beautiful Hedda of the late General Gabler, who too proud to lose the only power she believes she can still wield, sets in motion a tragic series of events that builds to a climactic and explosive finish. In this new adaptation set in the 1940’s and with an exciting original design sourced from the Film Noir genre this highly theatrical production is a must see for any theatre goer!! A Murder Mystery that’s less about the WHO and more about the HOW and WHY! !